Google Compare for car insurance launched in California | Android Blast! Google is providing auto insurance comparisons in California, with more states to come soon. 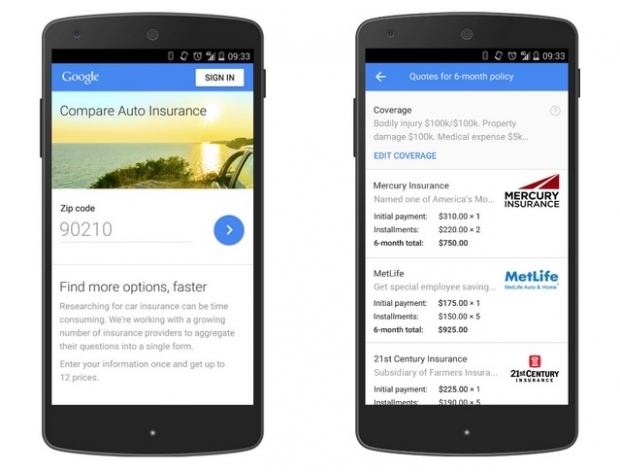 Google launched Google Compare today which will allow users to compare rates between insurance companies. The more information you have, the better decision you can make. When users search for car insurance they will see comparison information. The company also created a special website for comparing insurance companies. The company announced the launch on the Adwords Blog. Google Compare for car insurance provides a seamless, intuitive experience for connecting with your customers online. Whether you�re a national insurance provider or one local to California, people searching for car insurance on their phone or computer can find you along with an apples-to-apples comparison of other providers -- all in as little as 5 minutes. You can highlight what makes your business unique, whether that�s an �A� rating in customer service or better discounts for safe drivers. And when users adjust their deductible or add additional cars to their quote, you can show updated pricing that matches their needs. They can then buy their policy online or over the phone through one of your agents. The service is available in California now, and more states will roll out soon.